Learning how to snorkel is actually pretty easy, once you get past your body's very sane disbelief in your ability to stick your face in the water and breathe. But what a joy it is to learn how to snorkel. Not only are the underwater sights just simply mind blowing, but also floating easily in salt-water is a revelation akin to flying in your sleep. It is very freeing. While it may feel daunting at first, there are some wonderful surprises about snorkeling that make it both easier and more fun than it may first appear. First, you may not realize it, but floating in salt-water is ridiculously easy, even effortless. The high salt content means that your body will float much higher than in fresh-water, and you will not have to try to stay afloat. And the fins make it much easier to swim. The number one tip for learning how to snorkel is to relax in the water. Relax your body, relax your mind (but don't become unaware) and relax your breathing. Now, as for the basics of how to snorkel, I could not do much better in telling you than to have you watch this video by Simon Bell, a professional snorkeling and diving instructor. Unlike Simon in the video, we don't use wetsuits, probably because we snorkel in warmer waters. But we do often wear lightweight long sleeve skins, that are very thin and stretchy. They provide a tiny bit of warmth, but mostly we use them as sun protection. We also do not use any flotation devices, but you should if you feel the need. Probably the most important thing we have learned over the years is to get a correctly fitted face mask. When a mask fits correctly it will not leak. If your mask does leak, most often it is because it is too tight, not too loose. And if after an hour of snorkeling you have deep red marks on your face, it is also too tight, or a poor fit. Read our mask guide and our mask fitting guide too. Masks often fog up, making it hard to see. Learn our tips on how to prevent mask fogging problems. And as far as your snorkel goes, we really like the ones that have a self-sealing valve on the top, dry snorkels. These are a little different than just a splash guard. When you dive underwater the valve closes on the top so that your snorkel tube does not fill with water. When you come up, it opens. Ours have worked well. If you don't dive, you don't really need this. But we would recommend that your snorkel does have at least a splash guard. Also make sure the mouth piece is very comfortable with no hard spots. Silicone is best. Read our snorkel buying guide. What Happens If The Snorkel Gets Water In It? Snorkels will get water in them. But it is pretty easy to clear it, without removing it from you mouth. Just blow out forcefully, and the water will shoot out the top, and or out the purge valve in the bottom. The next most important thing is getting fins that are neither too tight, nor too loose. Also make sure that no hard plastic parts are rubbing on your feet. It should have a soft and flexible rubber boot. Hard spots and poor fitting will create blisters after an hour or two, or even a week. We prefer closed foot fins, that go completely around our feet, covering our heels. But you could also wear booties, and have an open heel fin. Read our fins buying guide. Unlike in the video above, we don't tend to put our fins on before we enter the water. We find it very awkward, and our chance of falling when entering is much greater. We also don't like getting sand and rocks in our fins. Instead we walk in barefoot, if it is a soft sandy beach, or we wear some form of footwear, like flip flops. Then once in deeper water, we put on our fins, and attach our shoes to a belt if we use them. Once you have those basic tools, your mask, snorkel and fins, then it just takes practice. 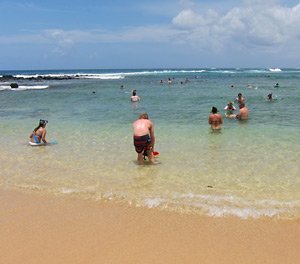 When learning how to snorkel, by all means start in a swimming pool, or a calm, shallow sandy beach. And one of the great things about snorkeling is that if you get uncomfortable you can just pop your head out of the water and take a break. Why not take a local class? Most dive shops offer beginning snorkeling classes in swimming pools. If you are planning on doing some snorkeling on a vacation, getting the basics down first is a great idea. If you are new to snorkeling and you are planning a trip somewhere, it can take a while to build up your stamina to snorkel many spots, or for a long time, in one day. The swimming muscles in your legs and the muscles in your throat that allow you to only breathe through your mouth, need to build up their strength at the beginning of a snorkeling trip. So, plan to start out slow, with 1 or 2 spots for the first day or two, then you can ramp it up.